As a general rule, cleaning hearing aids and ear pieces each day should be done with a soft, dry cloth. Make sure your hands are clean and dry before handling your hearing aids. Do not use water, cleaning fluids, solvents or alcohol, as these could damage your hearing aids.The microphone inlets can easily get blocked. If you are having problems with your hearing aids, check that the microphone inlets are not blocked. Before handling a hearing aid, make sure you hold it over a soft surface to avoid damage if you drop it. Your hearing aids “hear” through their microphones. All sounds first enter the device through the microphones before they are processed by the hearing aid and then sent into your ear. If the microphones are clogged, either no sound will go into the hearing aid or the sound will be dampened/muffled. If the microphones are damaged, the hearing aid will not work properly. Since they are the first line of processing, the microphones need to be clean and clear of debris. Maintain clean microphones by gently brushing over them with your hearing aid brush at the end of each day. If your daily activities expose you and your devices to excessive dirt and dust, you may want to invest in protective covers for your hearing aids. Ask your hearing healthcare provider for further information. For every daily wear hearing aid, regardless of style, the sound comes out of the device from a speaker and into your ear. The earpiece that houses the speaker and sits in your ear canal varies from patient to patient depending on your hearing loss and your hearing aid style preference. Regardless of style, it is important to keep the earpiece (e.g. dome, ear mold) clean of earwax and accumulated debris. If the earpiece is not cleaned the earwax and debris can migrate and clog the speaker and the device will sound muffled or dead. Not only will you not hear, but you will also be at higher risk for an ear infection from repeated insertion of a dirty dome or mold. You most likely have a wax filter on the end of your speaker to help protect the circuitry from damage. This wax filter can be changed by you or your hearing healthcare provider. For instructions on how and when to change your wax filter, please refer to your user manual or ask your hearing healthcare provider. 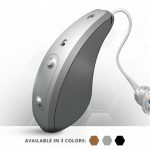 Your hearing aids are electronic devices. As with most all electronic devices, moisture can damage the circuitry. Avoid wearing your hearing aids when swimming, showering, and bathing. Remove your hearing aids before entering a steam room or sauna. Do not store or leave them in the bathroom. When not in use, open you hearing aid battery doors to not only preserve battery life but to also allow air to circulate through the battery compartment. Store your devices in their special drying kit overnight. If you do not have a drying kit, ask your hearing healthcare provider for information regarding the best drying kit for your hearing aids. When placing and removing your hearing aids, avoid pulling the tubing or wire that connects your hearing aid to your ear mold or dome. Over time, repeated pulling may tear, stretch, and/or crack the tubing or wire. 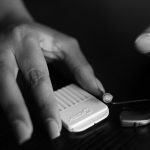 When handling your hearing aids, such as when changing your battery or while performing your daily cleaning, keep them over a soft surface to avoid damage if you drop them. Never put your hearing aids in the microwave or oven to dry them out. Do not leave them near heaters or in a hot car. Always apply personal care products (e.g. cosmetics, hairspray, perfume, aftershave lotion, suntan lotion and insect repellent) prior to placing your devices. Allow time for your product to fully dry before you put on your hearing aids. Direct contact with chemicals in can damage the hearing aid. Use a specialist for repairs and servicing. Never attempt to repair your hearing aids yourself. You may cause more damage, which may be irreparable. If you have more questions about hearing aid maintenance and care, please contact the board-certified providers at Arizona Hearing Center by phone at 602.814.0452, or by email [email protected] for more information.